You demonstrate that the legal minimum standards do not satisfy you. The attribution of the RAL quality mark therefore strengthens both your corporate image and the basis of trust between you and your customers. In addition, it makes it easier for consumers and corporate purchasing to search for reliable, high-quality products and services. The RAL quality mark is particularly advantageous for companies taking part in public tenders. The quality mark is often sufficient for the client to prove that the product or service meets the requirements for the tender. Given the public discussions about plastic waste and the 2019 amendment to the Packaging Act, with which the legislator intends to improve the eco-design of packaging, this issue is becoming increasingly important for those involved in the recycling cycle. The use of recycled materials for new packaging is explicitly mentioned in the law. For the PET market, this means a significant increase in the rPET rate above the previous average of 26 percent recyclate in disposable PET beverage bottles. The RAL quality association protects the high standard of its quality mark by constantly checking whether the quality and testing regulations are adhered to by all members and whether the quality mark is applied correctly. RAL German Institute for Quality Assurance and Certification supports the community and its members in this work. By means of appropriate publicity measures, it increases the level of awareness of the RAL quality mark and informs consumers and companies about the use and benefits of products and services with the quality mark. 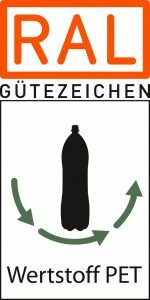 The RAL quality mark of the RAL quality association Wertstoffkette PET-Getränkeverpackungen is listed on the Label Online information page as particularly recommendable. The RAL quality Mark strengthens the company image and the trust basis with customers. In tendering procedures, the quality mark often serves as proof that the company meets the necessary requirements.